Come explore the activities at the farm and spend the day having fun or relaxing in the sun. There is sure to be something of interest here for everyone. Cost is $6 per person for anyone who attends the event. Tickets will be limited and available for purchase on line ONLY through our website. Can you say "FUN ON THE FARM" .... we sure can! 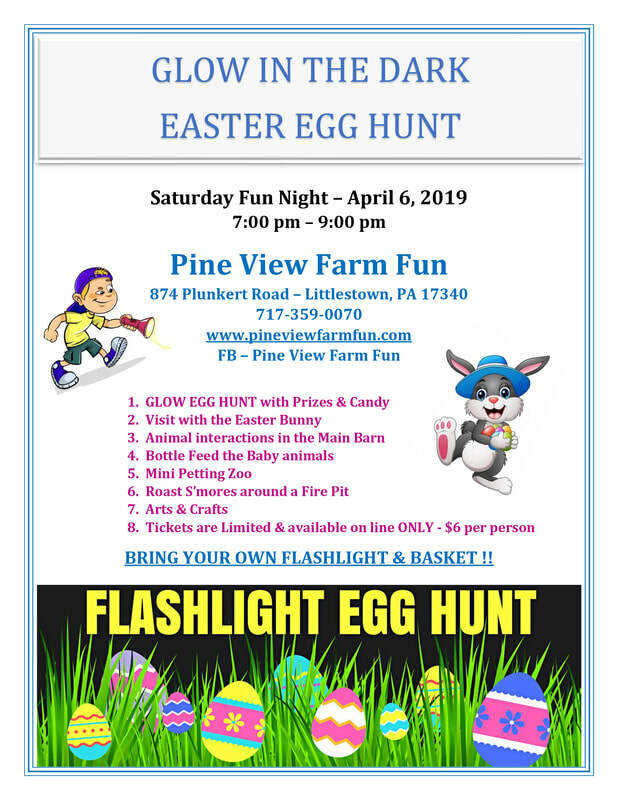 This event will host lots of fun for everyone...especially for the older youth who think they are too big for a traditional egg hunt...Spring will be here soon !! Hop on in for some fun. BRING YOUR OWN FLASHLIGHT & BASKET ! Due to the popularity of Our Fun Farm Egg Hunts we have decided to divide them into two sessions. Both Sessions will be the exact same event. Our egg hunt age groups range from 0-12. Cost is $6 per person for anyone who attends the event. Tickets will be limited to 250 per session and available on line for purchase ONLY. This will allow an enjoyable atmosphere during each event without overcrowding. Lots of fun for everyone :) Spring will be here soon !! Hop on in for some fun. BOTH SESSIONS ARE SOLD OUT !! ​We started this program in 2016 and it has proven to be a wonderful addition to the Fun Farm's list of special activities !! Join us again with our new, exciting, bigger than ever "Mommy & Me" classes during 2019 as we celebrate as the funnest farm around. Have fun exploring and making memories with your little ones as you watch the wonder in their adorable faces when education merges with fun! as it was requested from many of our guests. We feel certain that this will be a wonderful addition to the Fun Farm's list of special activities !! available on line only ! Everyone has requested it over and over again...so here it is !! Adopt a Plush Stuffed Pet with Doc McStuffins while she visits the Fun Farm. The night includes the following: Dinner - Pizza Slice, Chips, Applesauce, & Drink. A Stuffed Pet to adopt. Adoption Certificate for your stuffed pet dog or cat (your child's choice) Check Up & Health Form for your Stuffed Pet from the Doc. A Blanket & Toy for your stuffed Pet. Photo Ops with the Doc...and some real animal interactions too. This has proven to be a TOP EVENT at the Fun Farm's list of special activities !! See you soon. as it was requested from many of our guests. Join us with our exciting new, VIP Event...exclusively just for that special time between Dad's and their kids. A lunchtime Pizza Party with a Ninja Turtle stopping by on this special day. Reptile interactions, Animal interactions, a Scavenger Hunt and more! Adventure time for Dad's and Kids to celebrate the funnest farm around. Watch the wonder in their adorable faces when education and adventure merge with fun! Limited to 20 Tickets. with Special Guest appearance by: "Belle & the Beast"
*Dinner will include "Belle" & "Beast"
*New for 2019...No extra spots available this year...no exceptions!! ​group is listed under that age group tab. Registration Forms and Health & Record Release Forms must be completed and submitted along with your deposit to secure your child's summer camp spot. We will not hold spots without a deposit. Our farm fun Summer Camp program fills up fast and is usually booked by May each year. Don't miss out on such a Super Fun filled Summer in 2019 !! ​If you plan on attending the "Spirit Weeks" during our AWESOME Summer Day Camp Program...here is the list of themes !! These weeks have become very popular with our campers and counselors :) Looking forward to a fun new exciting 2019 summer season! Cost is $8 per person for anyone who attends the event. Tickets will be limited and available for purchase on line ONLY through our website. Can you say "FUN ON THE FARM" .... we sure can! This event will host lots of fun for everyone...especially for the older youth who think they are too big for a traditional dress up Halloween Event...If you've Got it, Haunt it !! Fall Fun on the Farm !! Stop on in for some festive fun. BRING YOUR OWN FLASHLIGHT ! If you've Got it, Haunt it !! Fall Fun on the Farm !! Stop on in for some festive fun. Holiday Events & More ! ﻿Welcome to Pine View Farm Fun, where learning and exploring is fun for the whole family. We are a family owned and operated farm located in South Central Pennsylvania. Just at the Maryland-Pennsylvania line, approximately 5 miles south of beautiful historical Gettysburg. We provide an atmosphere where you can relax and enjoy a day at the farm. Stroll through the petting zoo and visit with our animals. We have some typical domestic farm animals, a few exotic animals, and always have some cute baby animals seeking your attention. We have a small cafe, play area for the children, picnic tables, pavilions, petting zoo, pony rides, and paint ball for you to enjoy during your visit. We also host an action packed camp and birthday parties at the farm. Check the Activities on the Farm Page for an updated schedule of events and activities happening on the farm.